Active Farmers, a not-for-profit organisation and health promotion charity, was launched in New South Wales by Tasmanian-born Ginny Stevens, as a way of addressing the physical and mental health challenges of drought-affected farmers. The organisation now services 31 farming communities, with the first one recently launched in Victoria. Ginny’s vision is to build resilience in remote country towns, so when difficulties occur, people have a strong foundation to help themselves and others through tough times. This is done through group fitness and wellbeing sessions, mindfulness, nutrition and mental health workshops. 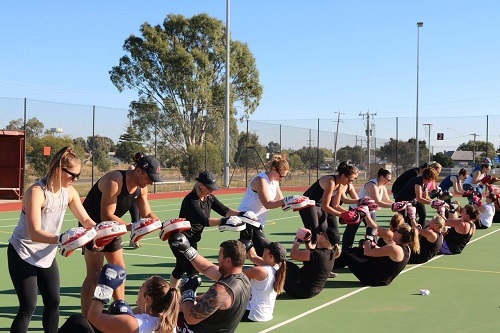 Claire Harrison, a mother-of-three young boys who runs a personal training business Loddon Fitt, recently joined the Active Farmers network to launch the first Victorian group at Bridgewater, north-west of Bendigo. About 15 years ago, Claire started an informal fitness group called ‘The Shearing Shed Sheilas’ who trained in an old shearing shed. She now runs Active Farmer classes four days a week attracting men and women from farmers to teachers, new parents and business professionals. “When you run a fitness business in a small country town, sometimes it’s just not sustainable. You might get two people turn up. Working with the Active Farmers group means we can do what we do no matter how many people show up,” says Claire. “Sometimes it’s the one thing they look forward to in the day,” she adds. “Over the years, I’ve seen people in this area having to deal with extreme weather conditions including floods and drought. It can be hard on everyone. The group sessions provide fitness benefits but also social networks and access to nutritional and professional mental health advice,” says Claire. Find out more about Active Farmers at the website and Facebook page.